Joseph must have become discouraged at times when he was imprisoned in Egypt for no good reason. But, his consistent faith honored God. The Lord was with Joseph and took care of him. This super simple craft will help remind your kids that God is with them no matter where they are or what they’re going through. Teacher Preparation: Pre-cut squares of card stock 4 inches x 4 inches. Step 1. 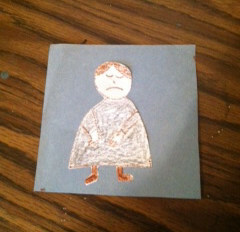 Allow students to draw and cut out a sad picture of Joseph. Make sure the drawing is no bigger than 4 inches x 4 inches. 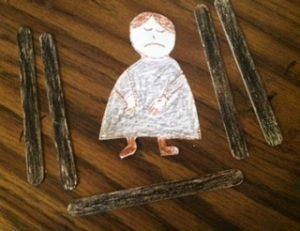 Give each student five craft sticks and instruct them to color the sticks black. Step 2. 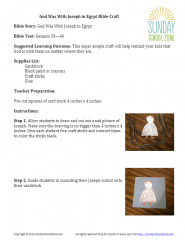 Guide students in mounting their Joseph cutout onto their cardstock. Step 3. 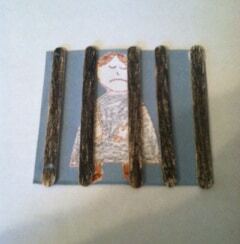 Instruct children to carefully glue the craft sticks over Joseph to become the bars of his prison. Remind kids that God was with Joseph even during his saddest times.